Happy hump day! This post will be short and sweet, much like this dress! This was yet another purchase from a recent LOFT sale. 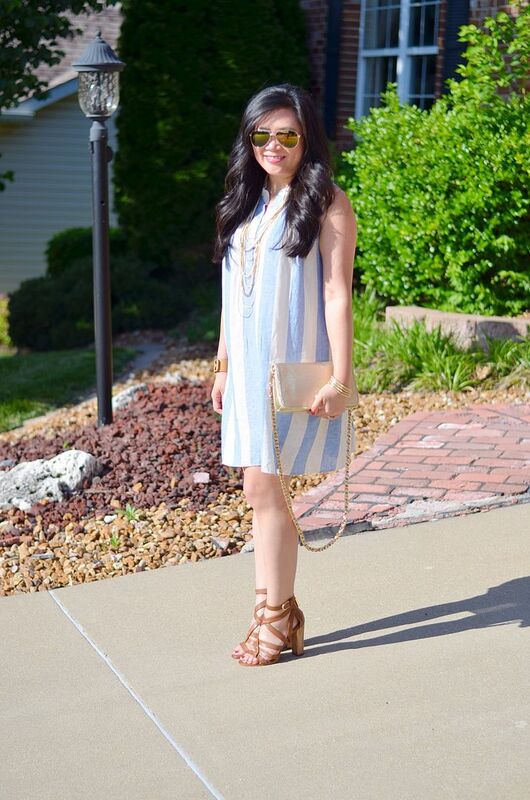 I couldn't resist the stripes, and I was craving a gauzy summer dress. It's definitely very voluminous - more than I'm usually comfortable wearing, even after I've tied it a bit in the back. However, it doesn't bother me, and I actually think it's quite appropriate for the style of this dress. Perhaps it's because I'm picturing myself sipping a pina colada wearing this dress walking barefoot in the sand somewhere. I suppose that's why LOFT called it the Cabana dress. Super cute - haven't been in Loft in awhile but planning on going next week! I've been loving a lot of their pieces lately! Ooh, fun! I am looking below this post and can see your flatlay with this dress vs. your real life version! Bonus material! 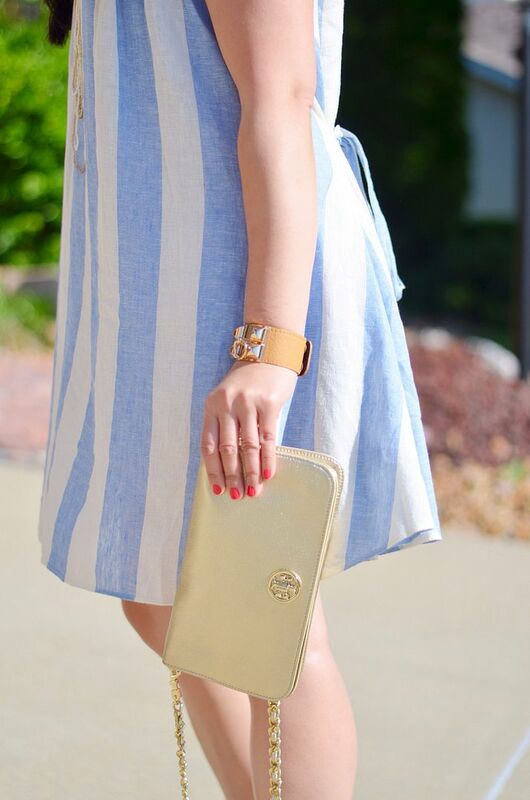 It is a great, easy-breezy summer dress. Love those sandals and that cuff, too! I'm surprised how much I like this dress, to be quite honest. It must be the stripes. But I'm not usually a fan of gauzy nor tents! Never say never, I guess! Haha, I think sipping piña coladas in this dress would be ideal! I love easy little pieces like this. Throw it on and go! It's one you can dress up or down so it's great! Hahah..Loft got you on the Cabana part didnt it? Loving the different stripe dresses you are wearing.. I have often seen loft easy wear dresses are very voluminous..even with a tie waist.. super fun and cute outfit..perfect for the hump day! Thanks, girl! Glad you like it! I love that dress! I'm glad you bought it! I saw a similar one at Forever 21 yesterday and tried it on and looked like a cow in it. Yours fits perfectly! I may need to try Loft instead! I'm totally with you on the stripes obsession. Stripes just makes everything better!!! I love this dress on you! You definitely need a pina colada in hand though, hey a new dress purchases is a good enough excuse for a vacation right?! Yes, totally! I've been bugging the husband for a beach vacation for months now! We just need to book already!!! cabana is correct! So cute!! BTW Nordstrom has those sandals on sale and I'm so tempted to get them. You know how much I love your shoe game! The snake embossed version is soooo tempting!! 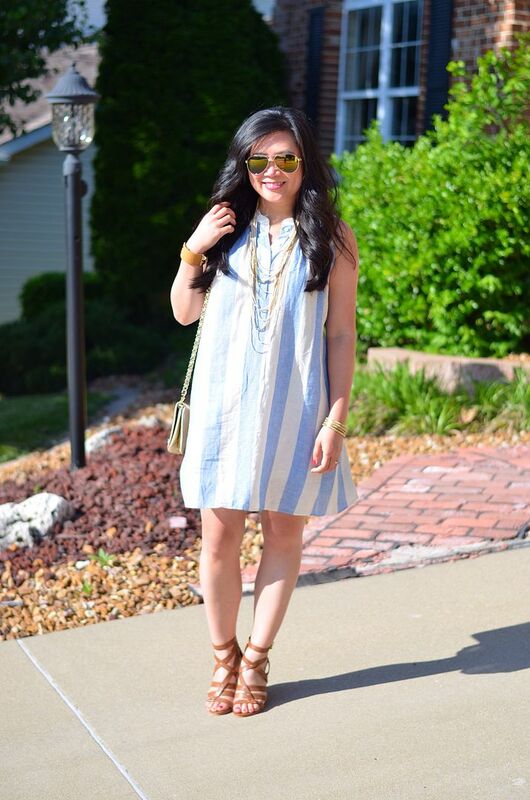 This is another gorgeous shirtdress I love and want, two great striped Shirtdresses in a row, Carylee. The name of this one is perfect and your styling is so well done, also. I'm definitely on a dress kick lately. Maybe it's me just being excited for warmer weather? This is such a Florida outfit, you look so so cute. I love that dress, the sandals, everything! Yesss! I will bring it when I make it there this year!! !